Speaker Elyssa Sierra Concha received a standing ovation! LCE Founder Maggie Dunne applied for a TED license to produce a TEDxYouth event in Rapid City, South Dakota. Her goal was to produce an event which engaged both Native and Non-Native Youth as speakers and helpers and allowed them to engage in dialogues about their ideas worth spreading. After the application and review process was completed, TEDxYouth@DinosaurPark was born and WOW was it a success! Elyssa Sierra Concha, spoke about the negative statistics that are used to define Native Youth on Pine Ridge Reservation and the people behind them. Her frank and intimate discussion brought the audience to their feet and earned her a standing ovation. Andres Gallardo, an artist and activist who has been very involved in LCE’s art program, spoke about how he created the GEM Movement (“Giving Everyone Moments”) by distributing his artwork around the world — for free. Andres has participated in LCE’s art programs in the past. Regan Garcia, a High School student from Rapid City, spoke about today’s definitions of gender identities and the new vocabulary that goes along with those identities. Amanda Hadden, the Founder of the Adorned Campaign, which seeks to encourage young women to focus on self worth, delivered words of encouragement. The Adorned Campaign has partnered with LCE in the past to provide support to young women on Pine Ridge Reservation. Khian Norby, an 11-year old musical genius, rocked the house with his guitar and his message about doing what you love! Tara Rose Weston, Oglala Lakota, spoke about the obstacles she faced growing up on the Pine Ridge Reservation and as the member of a military family, and how Lakota values helped her to persevere to make a good life for herself and her family. Tara encourage youth to be resilient. The event took a Village to Produce. Organizers were: Maggie Dunne (Lead Organizer and Speaker Coach), Cindy Dunne (Organizer and Speaker Coach), Troy Fitzpatrick (Organizer and Venue Coordinator), the Journey Museum and Learning Center (event venue), the FILM ROCKERS videography team at the SD School of Mines, William White Photography (check out the Flikr Album), The South Dakota School of Mines (made the TEDx Lettering for the event), Office Depot Office Max in Rapid City, the Performing Arts Center of Rapid City and and a cast of more than 40 adult and youth helpers from Rapid City, Pine Ridge Reservation which reached into the local Rotary Clubs, LCE’s Youth Board and engaged Native and Non-Native community members. We have assembled some of the videos here below…. ENJOY! Special props go out to the SD School of Mines’ FilmRockers. Lead Media Director John Harrison coordinated all media necessary for filming, was a cameraman during the event and then edited all of the videos in the project! Thanks also to FilmRockers cameramen: Ezra Thorson, Charles Heyer, and Brian Roberts. You guys rock! 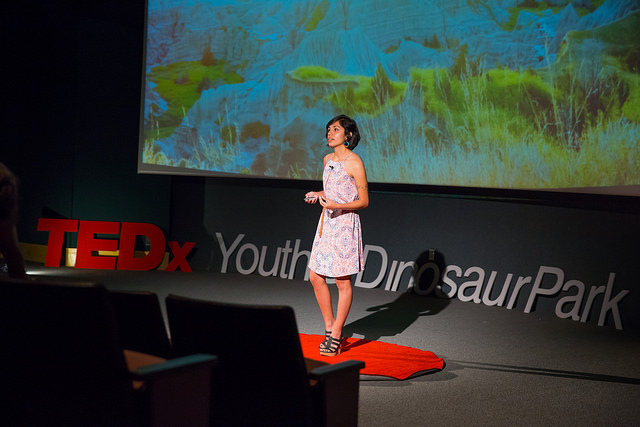 TEDxYouth@DinosaurPark took place in April 2016 and is the first TEDxYouth event ever produced in Rapid City, South Dakota.